You are unable to access any data from a previously functioning computer system or backup. Data has accidentally been erased or data control structures have been overwritten. Data has been corrupted or made inaccessible. 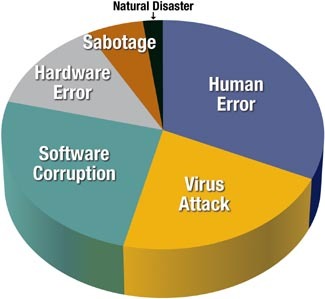 Most data losses are caused by human error, although other causes rank close behind. How can you prevent data loss? Back up your files. External drives are an excellent choice for this backup task. Then test and verify your backup. Use Windows XP System Restore Points before making any significant changes to your system. Never upgrade software or hardware without a complete, verified backup available in case you need to restore data. Document your systems and archive original copies of your software in a safe place. Ensure proper environmental conditions (stable temperature, humidity and cleanliness) and proper handling to avoid static discharge and accidental dropping. Delete unused files and applications. Use a disc defragmenter. Physically secure systems from intruders. Deploy firewalls and virus protection. Prepare for physical disasters, including use of offsite storage for backup. Copyright © 2004-2015, GoRecovery.com. All Rights Reserved.